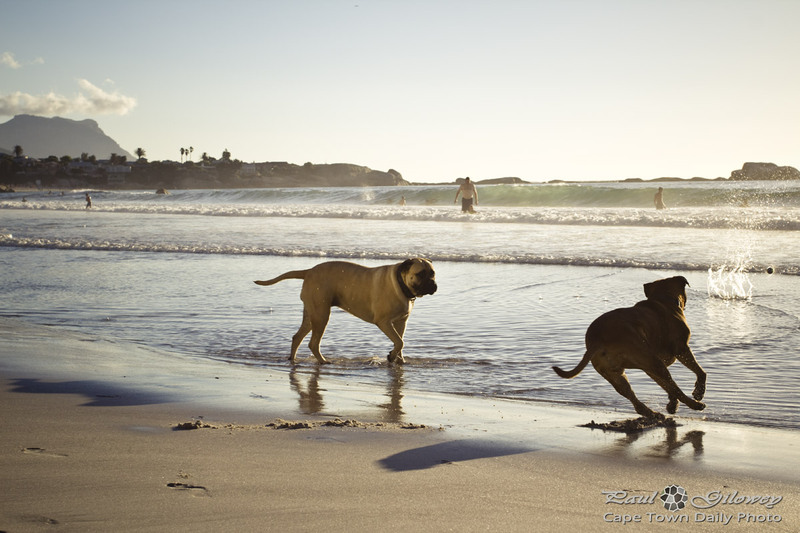 It's a pity for dogs and dog-owners that beaches like the blue-flag ones at Clifton and Llandudno have had restrictions imposed that permit dogs on the beach only between 18h00 and 09h00 in the summer months, and then, only if the dogs are on leashes. Dogs love to run free on the beaches, chasing balls and crashing though waves, but the reality is that there have been incidents where innocent kids have been attacked and where people who are desperately afraid of dogs have been traumatised. Since law enforcement officers aren't able to tell the difference between a dangerous animal and a friendly puppy, and since people who are afraid of dogs couldn't care if the dogs would never attack them, it makes sense to compromise in the way the City has. For what it's worth, I took this photo after 18h00, so these friendly four-leggeds were allowed on the beach, but since they weren't on a leash I believe the owners were in fact breaking the law - perhaps unbeknownst to them. Posted in General and tagged beach, clifton, dog on Friday, 28 December, 2012 by Paul.